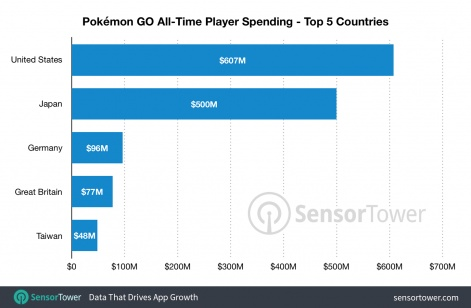 Niantic's smash hit location-based augmented reality mobile game Pokemon Go has generated $1.8 billion just two years since its launched. According to mobile intelligence firm Sensor Tower, the title continues to pick up $2 million a day on average from avid fans. The game is by far most popular in the US and Japan, where it has racked up $607 million and $500 million respectively. In Germany meanwhile the game has brought in $96 million, while Great Britain accounted for $77m and Taiwan $48 million, rounding up the top five countries for the title. Interestingly, Google Play accounted for the majority of Pokemon Go’s revenue at 58 per cent. The App Store made up 42 per cent. Traditionally Google Play has been known as a larger driver of downloads while App Store releases often made more money. The good times could be set to continue for Pokemon Go. It’s gearing up for a China release following a partnership with NetEase, while it recently added the much anticipated trading feature to entice players back.